Poll Tax was back in the news and now, not content with summonsing those who hadn't paid, the council were doing the same to those who had paid. Many residents received summonses for non-payment having already coughed up the required amount. Councillor Henry McCormack wasn't pleased. He said: "These people have made the correct arrangements and now they have been summoned to court. This shouldn't be happening and I want to know what's going on." There was an easy answer of course, the tried and trusted 'computer error'. "I understand this has happened as a result of a computer error, and that these summonses have been sent out in error," said Finance Sub-Committee Chairman Councillor Peter Kenyon. Maybe those who hadn't paid could then claim they had. Given the poor state of the computers I don't suspect anyone could have disproved it. Councillors don't half give themselves some fancy titles but if the Chairman of the Burnley Civic Trust had had his way we would have even been appointing a Nuisance Officer. Now this one intrigued me. What on earth does a Nuisance Officer do other than perhaps make a nuisance of himself, so I read on. The Civic Trust Chairman was Mr Lynn Millard and he called for the town to appoint such an officer with immediate effect to pounce on litter droppers and to prevent shops from obstructing the pavements. "It's not a new idea," he told the annual meeting and then quoted from Walter Bennett's book 'History of Burnley' to show that a nuisance officer had proved to be a very effective appointment in Victorian Burnley. I don't think Mr Millard got very far with his request to be honest and I still can't quite work out how shops might rush out from themselves and block the pavements. If we weren't having a Nuisance Officer then the town confirmed the appointment of its first ever Urban Wildlife Officer. She was Kim Coverdale and she came very recommended after being involved in a highly successful hedgehog survey. Again it got me wondering whether she organised people with clip boards to wander around the town centre questioning any hedgehogs that might just be passing, but it was confirmed she would be based at the Natural History Unit within Towneley Park. One young man in town passed his driving test. When I passed mine it meant I could get behind the wheel of a car and drive it unaccompanied. For this 17-year-old youth it meant a party at a farm on Brownside Road, and what a lively affair it was. You would have expected people to turn up with bottles of something alcoholic, and perhaps a bottle of coke for the under age (in terms of drinking) party host. Not on your life; they turned up with screwdrivers (the ones you find in a toolbox), knives and broken milk bottles. Surely they wouldn't be of any use at a party? Yes they would, particularly when all hell broke loose. Police were called and four arrests were made leading to four people, aged between 16 and 19, appearing in court. All four pleaded guilty to violent disorder and possession of an offensive weapon and they got a mixture of supervision orders, probation and community service with a warning to be careful what they took to parties in future. Burnley was preparing for Christmas shopping and it was confirmed that the Christmas lights in the town centre would be switched on by Shirley Anne Broadbent. Shirley was better known by her acting name of Amanda Barrie and even better known by her Coronation Street name of Alma Sedgewick. She was expected to pull in big crowds to the market square. There was some good music to be had locally. Canned Heat were on the road again and going up country to Colne Muni whilst here we stood for the Milltown Brothers at the Mechanics in Burnley. Kitty O'Shea's Good Time Emporium was well and truly open and had two great nights on over the weekend. There was the rock-blues Victor Brox Blues Train and Sounds 18, an 18 piece big band sound. Over at Turf Moor, Burnley Football Club had received a grant of £4,604 from the Football Trust's Licencing Authority for the provision of extra crush barriers and the club revealed that Marketing Manager Joyce Pickles would be leaving. Director Bob Blakeborough said: "It is with regret that I confirm that Joyce Pickles, our Marketing Manager, will be leaving the club at the end of November to pursue a new business venture on her own account. "I am, however, pleased to advise that Joyce will continue her involvement with Burnley Football Club in the immediate future as Marketing Consultant." The club used the Burnley Express to advertise for Joyce's replacement but on the field everything was going to plan with yet another league win, the eighth since Jimmy Mullen became manager. This time it was a 1-0 win at Maidstone and It was a key game as the manager said before leaving Burnley for Kent. "Losing there cost us promotion last year, there's no doubt about that. "We were on a great run when we went to Maidstone and lost to a dubious penalty. If we had won there we would have gone up." Mullen named the same starting eleven who had beaten Doncaster in the Autoglass Trophy in midweek with Graham Lancashire and Mark Yates again named as the substitutes. It was our third visit to Watling Street. We'd won there in the 1989/90 season and, as Mullen said, lost a key game there in the penultimate away game of the 1990/91 season. It was a game where we didn't hit top form, but we were by far the better side and there was some justice in the only goal of the game. Having lost to that penalty just a few months earlier it was sweet revenge to win this one by the same means. This was a game of very few chances, in fact a game with very little goalmouth action and in truth not much to commend it. Burnley, however, were strong in midfield where John Deary and Andy Farrell were in top form and with Steve Harper and John Francis providing opportunities down the flanks we were always the better side. The one concern for the Clarets was Liburd Henry, Maidstone's leading scorer. He was good, but he was such an individual that it was rare to see him pass the ball to a team mate. 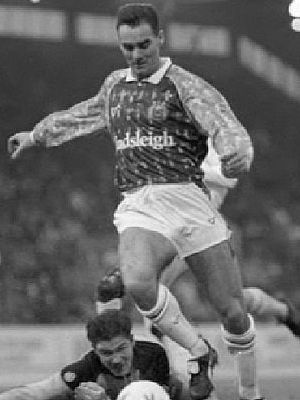 So, Burnley pushed him wide as often as they could and the full backs Ian Measham and Joe Jakub dealt with him to such an effect that he didn't have one noteworthy effort on goal. 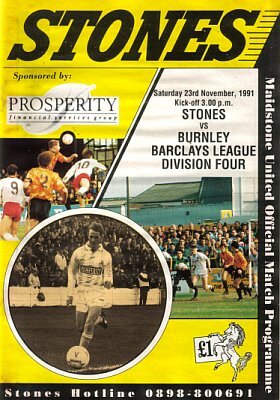 Maidstone's only other idea was to hit big high balls into our box and when that came to nothing with Steve Davis and John Pender dominant alongside a goalkeeper, Andy Marriott, in top form, there was nothing more to come from the home side. They key moment came just past the half way in the first half when Roger Eli beat Darren Oxbrow to the ball. Having beaten him once, he beat him again, got into the box only for Oxbrow to come back at him and bring him down. Referee Pooley didn't hesitate in pointing to the spot and up stepped CONROY just a week after missing a penalty in the FA Cup. He made no mistake this time and gave Burnley the lead. Thankfully that was enough and in what was probably the most disappointing game to watch since Mullen had taken charge we still came home comfortably with the win, our eighth successive league win and our fourth on the road. And with other results going our way, it had lifted us back into third place in the league with the top getting ever closer. Mullen said: "Nobody relishes coming to Maidstone. They're a strong physical side and anyone who has seen today's game wouldn't think that they are near the bottom of the table and we're near the top. "Maidstone always make things difficult for teams, but I told my players that if they won their individual battles they would win the battle as a team, and that's what they did. "We had the chances to make it 2-0 and if we had done that it would have closed them out of things. Maidstone might feel a bit aggrieved to come out of the game with nothing, but I thought we deserved the points." Maidstone United: Iain Hesford, Bradley Sandeman, Les Thompson, Paul Haylock, Darren Oxbrow, Stuart Nethercott, Robbie Painter, Gary Stebbing, Jason Lillis (Steve Cuggy 78), Lawrence Osbourne, Liburd Henry. Subs not used: Mark Smalley. Burnley: Andy Marriott, Ian Measham, Joe Jakub, Steve Davis, John Pender, Andy Farrell, Steve Harper, John Deary, John Francis, Mike Conroy, Roger Eli. Subs not used: Mark Yates, Graham Lancashire. Referee: Graham Pooley (Bishop's Stortford). What a boost when we got the other results. Blackpool, who had gone above us when they played in midweek were surprisingly beaten by Crewe Alexandra 2-0 at Bloomfield Road with Darren Carr getting both their goals. Above us there was a change at the top. Mansfield Town beat Gillingham 4-3 and that was enough to take them above Barnet who lost 1-0 at Rochdale with a first half goal from Jon Bowden enough to see the league's newcomers lose top spot. Burnley faced another two away games in the next week with an FA Cup replay at Doncaster followed by the league game at Northampton, one which would be Andy Marriott's last for Burnley.